Little Cotton Rabbits has a knitting pattern for these gorgeous decorative Christmas stockings. Hard to choose just one design, so best I knit them all. I don't think I will ever have a tree with as many home made decorations, whether knitted or stitched, as this amazing tree full of knitted decorations. There are many novelty patterns on Craftbits , including an iced chcocolate cake, liquorice allsorts and a slice if cherry pie. Bittersweet has a free pattern for a slice of chocolate birthday cake. Just one slice won't hurt! Jean greenhowe has some free patterns for some jolly knitted eggs, just the right size to pop a little chocolate egg into. 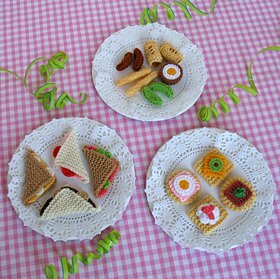 There are also two lots of "Tea Time Treats patterns" on the same page, knitted sandwiches, cakes, biscuits and finger food. There are a few more lovely patterns on the page as well. The Rainbow babies make ideal fund raisers. The shops are full of Easter eggs and, indeed, we have already eaten a few Cadbury's creme eggs. Time to break out Kristine Michelle Howard's Easter Chick knitting pattern again. It makes an ideal cover for a surprise chocolate egg. Nothing to see here has an article on a Knitted village that you can see in Lancaster. It's in the building that once was Hornsea Pottery. I worked on the leisure site there for a few years and have some happy memories of the place. I seem to be drawn to novelty knits. As a child I coveted the knitted prizes on the tombola and longed to knit a humpty dumpty or rag doll with 3 foot long legs so that I could have one of my own. I spent my pocket money on booklets of "Bazaar knits" filled with patterns for poodles to cover your toilet roll, tea cosies in the shape of Swiss chalets and not forgetting bed socks, hot water bottle covers and peg baskets. Once I found an entire book devoted to knitting your own farm. The fact that I was in my twenties at the time and had not yet had a child mattered not a jot. I had to buy the book, I might need to knit a farm one day. Hannah Simpson of Electric Biscuit has featured some Knitted Zombies on her site. They would make lovely Halloween Party gifts, should she ever publish the patterns. Someone here at Annelies de Kort was determined to have tea cosies that matched the tea pots.